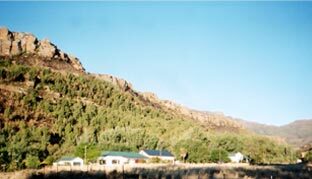 Comfrey Cottage Guesthouse accommodation and self catering accommodation in Lady Grey. The Comfrey Cottage Collection is set in a park-like garden at the foot of the Witteberg mountains in Lady Grey. The Collection consists of three cottages: Comfrey, Robins Nest and Apple Crumble, each containing a number of en-suite bedrooms. Each room has its own distinct character, beautifully renovated and decorated to enhance your country experience. All rooms and the dining room are decorated with Wetherleys furniture, ensuring comfort and style throughout. There is free WiFi available in the guest dining room and lounge area. The guest areas are very comfortably furnished, with a roaring log fire during winter and lovely fresh mountain breezes and views during summer.Beds and bases are of the finest quality, with white polycotton percale linen used in all bedrooms. Light yet warm duvets and throw blankets will keep you snug at night. Electric blankets are provided for extra warmth during winter. All bedrooms have fans, heaters, full tea trays (tea, coffee, milk, sugar, homemade buttermilk rusks, filtered iced water and kettle water) as well as a welcoming sherry! All bathrooms have full guest amenities wrapped soap, shampoo, body lotion and shower caps. Hairdryers and clock-radios are provided. Let us spoil you with sumptuous meals in our licensed guest dining room. The advertised rate is for bed only but we do provide breakfast on request. The Comfrey Breakfast is quite famous Ã¢Â€Â“ do try the special oats porridge to start your day with a difference! All meals are prepared by Chef George using the best, freshest ingredients available, prepared and cooked using purified water and served in the stylish dining room. Self-catering is also available. Comfrey Cottage (i.e. Blue Room, Green Room and Iris Room) can be booked as a fully self-catering unit, and Apple 2 has mini self-catering facilities (microwave and bar fridge). Comfrey Cottage Collection provides a cosy retreat for the weary traveller. Relax under the trees; stroll along our riverside walk while you savour the fresh country air; meander through the orchards, herb and vegetable gardens; feed the Alpacas; or join others in our guest lounge to share tales and experiences. Whether you are on holiday or business, the Comfrey team - the Three Gs (George, Gerda and Grant) - has the facilities to satisfy your every need. Reading our guest book will confirm that: Going the extra mile is what we do best. You will be cared for by people who care for this piece of Paradise, for your comfort, and who pride themselves on attention to detail and quality on every level.